TAYLOR'S UNIVERSITY is a member of the Taylor's Education Group, which also comprises Taylor's College, Garden International School, Australian International School Malaysia, Sri Garden International School, Nexus International School, Putrajaya and Nexus International School Singapore. A world-class leader in education, year after year. 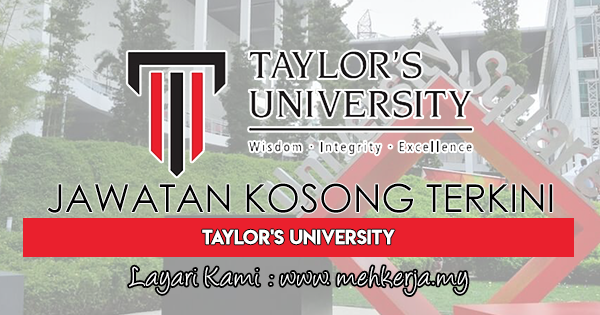 Taylor's University is a member of the Taylor's Education Group, which also comprises of Taylor's College, Taylor’s International School, Garden International School, Australian International School Malaysia, Nexus International School, Putrajaya and Nexus International School Singapore. Since its inception in 1969, Taylor's has become one of Malaysia's most successful and reputable private higher education institutions. 0 Response to "Jawatan Kosong Terkini di Taylor's University - 6 Mei 2018"